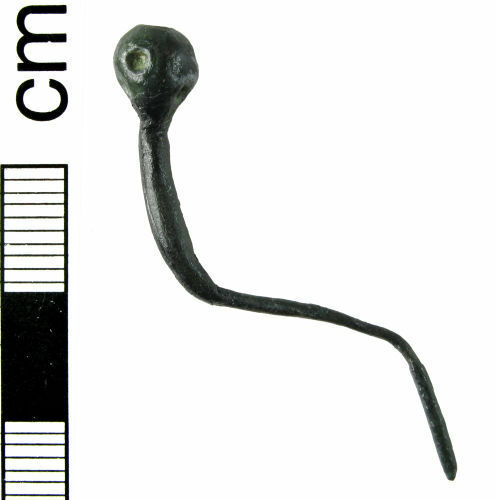 A worn, but complete copper-alloy pin of early-medieval date. The head is roughly biconical with a flattened top. It has a maximum dia. of 6.95mm and a height of 7.1mm. It is decorated with punched ring and dots. There is a ring on the top of the head with three more, equally spaced, below it, just above the median point. There are a further three below these latter in the lower half of the head, below the gaps between those above. The pin lacks any obvious collar below, the collar being a characteristic of Middle Anglo-Saxon pins (Geake 2001, 39). The shaft is circular in cross-section and 2.6 in diameter below the head. Over a length of 14.4mm the shaft curves slightly, before tapering dramatically and bending through approximately 110 degrees. Beyond the bend the shaft continues for c. 14.7mm before bending downwards again, through around 80 degrees. The final section of the shaft is c. 12.4mm long. The pin has corroded to a dark-green colour and survives relatively well. Although it lacks a collar, the form and decoration of the head, as well as the bends, would suggest a Middle Saxon date for this object (Geake 2001, 39-40). The pin was found in two parts, broken at the first bend, and has been reconstituted by the finder.